All transactions are safe and secure with a reliable history in online purchasing behind each of our associates. Buy the Clark - "Can I Refill Your Eggnog?" t-shirt to own Christmas Vacation clothing and merchandise. Frustrated by Cousin Eddie and his family's unannounced Christmas visit, Clark (Chevy Chase) asks Eddie, "Can I refill your eggnog for you? Get you something to eat? Drive you out to the middle of nowhere and leave you for dead?" Eddie replies, "Naw, I'm doing just fine, Clark." After a slight change of heart, Clark and his wife Ellen (Beverly D'Angelo) take it upon themselves to buy Eddie's children Christmas presents after they fully realize the severity of Eddie's financial situation. 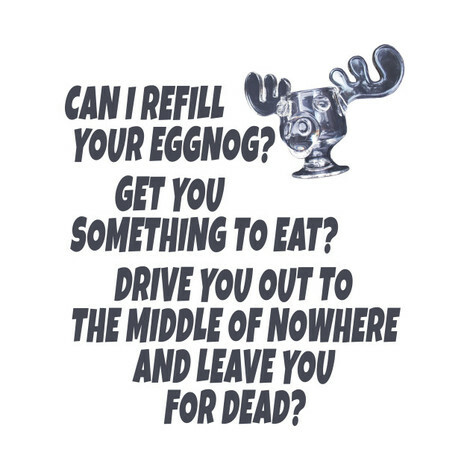 In addition to the Clark - "Can I Refill Your Eggnog?" tee above, browse the Christmas Vacation Clothing Gallery for more apparel like men's and women's clothes, kids shirts or hoodies.